This is the story of a Kavango tracker who served for six years with Koevoet (`Crowbar'), the elite South African Police anti-terrorist unit, during the South West African-Angolan bush war of the 1980s. Most white team leaders lasted only 24 months; the black trackers walked the tracks for years. Sisingi Kamongo tells the story of the 50 or so firefights he was involved in; he survived five anti-personnel mine and POMZ explosions and an RPG rocket on his Casspir APC vehicle; he was wounded three times; he tells of the trackers looking for the shadows on the ground, facing ambush and AP mines at every turn; he tells of the art of tracking, where dust can tell time. 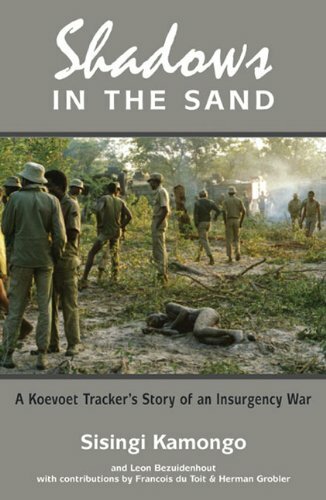 A unique, previously untold perspective of the bush war, Kamongo's story is supported by two accounts from renowned Koevoet team leaders, Herman Grobler and Francois du Toit, and becomes a powerful collection of experiences from South Africa's most successful counter-insurgency unit. About the Authors Sisingi Kamongo was born in 1965 in the rural area of Ndonga Muramba in Kavangoland in northern Namibia. As child he learnt his tracking skills looking after his grandfather's cattle. After school he joined the police and was based with Koevoet at Rundu for six years. Leon Bezuidenhout was born in 1966. He did his national service in the South African Police, after which he lectured at the University of South Africa. He later entered the private sector and is a businessman and company director. Leon Bezuidenhout was born in 1966. He grew up in Pretoria and attended Pretoria West High School and the University of Pretoria. He did his national service in the South African Police, after which he lectured at the University of South Africa. He later entered the private sector and is a businessman and company director. Sisingi Kamongo was born in 1965 in the rural area of Ndonga Muramba in Kavangoland in northern Namibia (formerly South West Africa). As child he spent his time between the bush where he looked after his grandfather's cattle-learning his tracking skills-and school. After school he joined the police and was based with Koevoet at Rundu for six years. He became an elite tracker and car commander. In 1990 he came to South Africa where he worked in the security industry as a tracker until he lost the use of his legs due to a piece of shrapnel still lodged in his back, the result of his last POMZ incident.